Once more I have heard the sorrowful pleas of a skirt that is tired of its black tshirt partner. I can’t blame it really, it’s not doing either of us any justice! 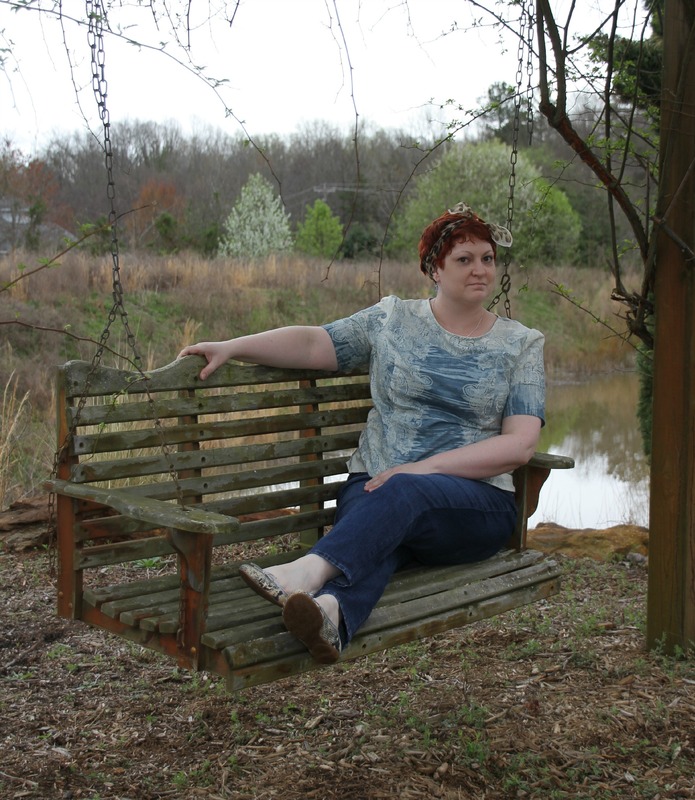 Last year I whipped up Butterick 5991 and I love it! So easy!!! I’ve been trying to make my style match my life- work, play, age, whatever. This is hard when you like to think of yourself like this: psssst- The one on the right!!! Seriously- I know she’s got 40 years on me, but her fab style is burning Maggie! So todays plan is a very subtle swing in this direction by way of Vogue and the middle east. Vogue 8799 has really fun lines to it and I’ve been wanting to make the top for quite a while. I don’t remember when I got this placemat material – it’s heavy and frays like a teachers nerves the day before a break. But the weave intrigued me. So I made a love connection! Now this top took some work and 5 bobbins worth of tangerine! I had some major fit issues. I did my usual humpback whale alterations, and did a little try on. Holy Priceless collection of Etruscan snoods, Batman! That is a lowcut top! Seriously. I sensed it was low, but I didn’t realize I could scratch my belly from the neckline! So I removed the front panel, eyed the circles on the pattern, which yes, they did match and decided to add 4 yes, 4 inches to it. 4 inches. The length of Africa’s goliath beetle! Don’t say I don’t strive to educate here, folks. Ok, now I can leave the house in it. Being that it goes from winter (burr) to hades here in SC very quickly, I didn’t line this- before I finalized my shoulder seams, I made a facing tracing around it. Much better for my heavy bizarro basket weave fabric. So I have a very unrecognizable salute to a Kameez- or Salwar suit top. So far so good, but look at how it climbs up- so stiff! Orange kevlar. So stylish. Lesson? I need to keep moving in the style direction I am trying, but keep the fabric fluid and sensual- wear it, don’t armour up in it! I look like a warning in this! photo credits: pattern review, meadhawg, pinterest,bbc, pattern review. All images remain the property of their original owners. I will try this vogue again- slubbed sounds perfect! Oh, I so love both and I am wondering with the orange beauty that if you made it sleeveless? I’d hate to have you ship it off to the other world where some of my sewing mishaps have gone! It’s such a pretty color on you! Ooh- that is an idea!! Im going to try taking an armoured sleeve off…. You continue to make me laugh out loud! 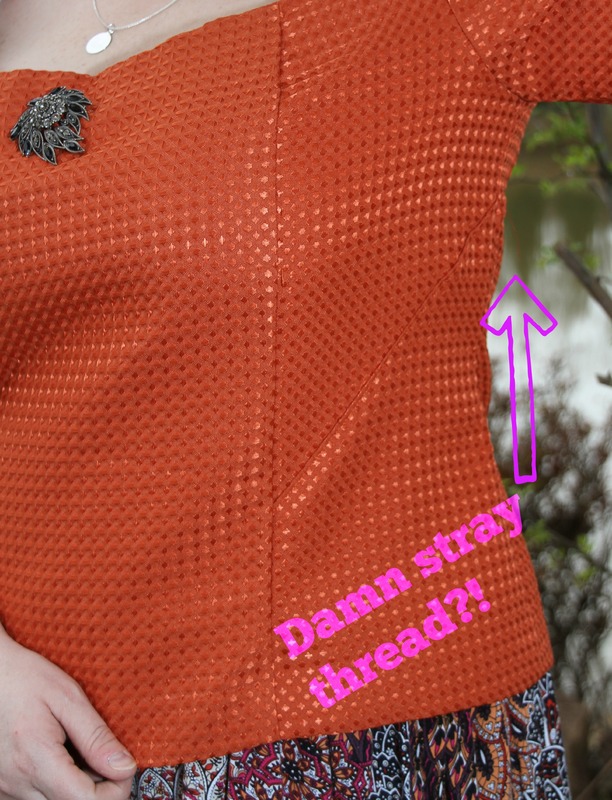 Orange Kevlar–I will add that to my list of fabric foibles. My current target is the Pilling of Knitwear. I made a top, ate my dinner and had pilling along the waist and sleeves. I didn’t even have to cut my steak, so must blame it on reaching for the wine glass. Love your blog! You had me subscribe with your Film noir post. I have worked up much pillong myself eating corn on the cobb- fashion hazard? 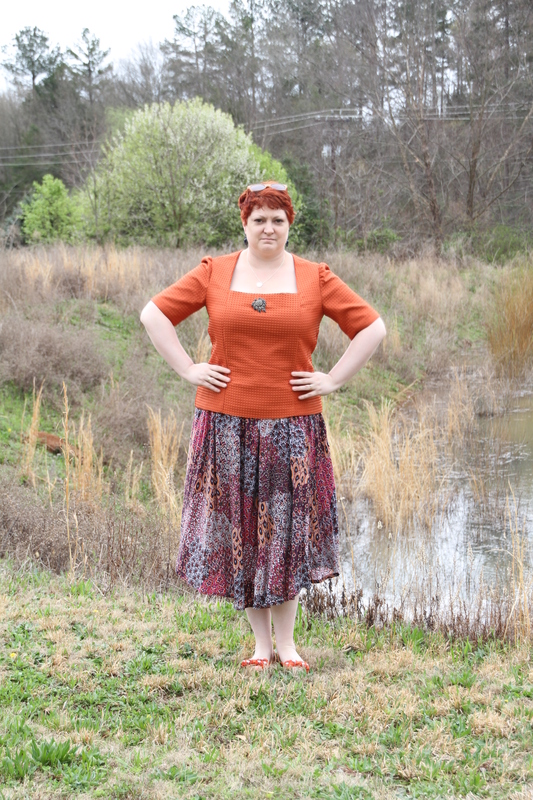 Love these tops, the orange looks great on you too bad you find the fabric to be too stiff. The Butterick top looks so comfortable, I’ll have to give that pattern a closer look. I think they are both headed for a repeat! I like the second top better, but I really want to know about the skirt. I have that fabric but haven’t done anything with it yet. The skirt was so easy! Its got 3 different hems- I did the scallop- elasticwaist- quick and very satisfying! Still the style is great and really flattering- I think I’ll have a go at it. Do it! I just love the lines of it- I have a light linen that will get the 2nd try! Shame it’s not comfy cos it goes well with the skirt. Thanks! I do love them together, sadly! What about cutting down the middle and turning it into a little jacket? That is a fascinating idea- that couldbe really cute! Ah – the vogue top is a tough one…but really like the Lisette! Tough- and possibly an excellent exfoliant! So sad the orange top is too stiff because it looks great. And it’s orange! I think you are on to a winner with both of these styles. I think some more thought on texture is in order! Oh, I like the orange top. Too bad it’s not comfortable. I understand. I’m all about comfort myself. By the way, since you’ve been thinking in that direction, have you ever taken a look at Advanced Style? Honestly, I’m not terribly impressed with the latest posts but if you dig deep enough into the archives you’ll find some more interesting stuff. I need to look that up, thanks! There are still places in Northern Ireland where orange kevlar vests are de-rigueur! You’re just in the wrong country. However, I really like the overall shape on you- neckline, sleeves and length – make it again in another fabric. I am ready for deer hunting in my neighborhood too! You have to redo with that neckline………the neckline is perfect! Thank you! Im still hooked on this shape!! I love how you’ve centered the pattern on the blue top–very pretty and ultra girly. The orange fabric has such cool texture too. 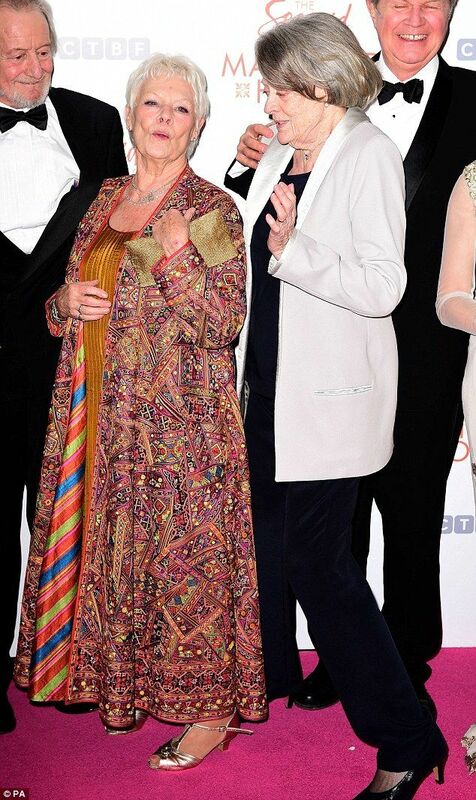 May we all aspire to be half as stylish as Dame Judi. 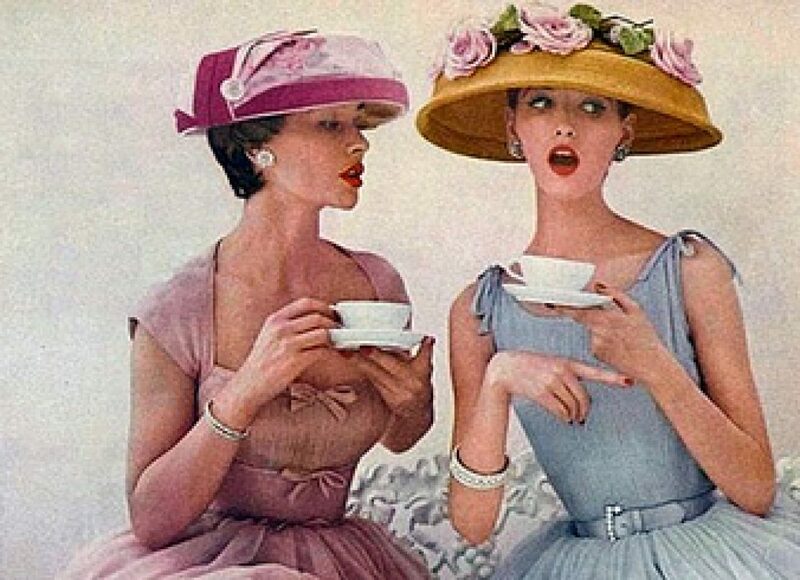 I think I have a vintage Butterick with a similiar top and pencil skirt! Oh, I could be kevlar Joanie! New to your blog and loving it. I like both styles on you and I love the orange. Wish I could wear orange! You know, I’m looking at the HBC outfit and I’m thinking you would look great in a jacket and skirt in a bright plaid. I am sorely tempted, Ma’am!! I love that Vogues lines- I will try again! I think we should all aim for tops to feel like wearing pillowcases. 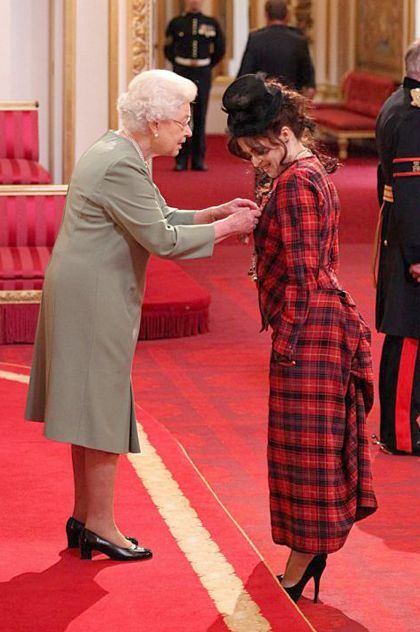 But only those crazy lovely ones from hotels… Also, HBC is pretty much the bees knees. More plaid for us all! I do love the colour of both tops. The seams and cut on the Orange one are especially nice – makes the lines very lovely! I do understand though that choice of fabric can make such a difference. That is something I am still working on! Its hard for me to reconcile my visionwith doability! It is a shame it’s not comfortable, because it’s cute. Plus it’s orange and that is always amazing. You should try it sleeveless if it’s impeding your arm raising in case of hold up, though you’d be fine if shot in the torso since it’s kevlar. That orange top is divine and the colour is gorgeous. Such a shame it is not comfortable and rides up. The skirt with it is fabulous. Love your second top too. I willhunt down some light weight orange to make this work!! The neckline in the orange number is now perfect – try it in silk crepe? I think thats lovely idea! That Lisette top is where its at! I can’t wait to see it become a TNT for you…so many options with those flattering seams. I am no longer on the fence about the pattern now that I’ve seen how well you rock it. Yeah, it’s silly for a top like that to have a zipper. The designers do that just to make things look all designer-y, but they forget real people (lazy people) gotta sew and wear that jazz! So cozy- a nape zipper! Well, it’s now an unwearable muslin , I guess! Such a shame the Orange fabric is so stiff because the shirt looks great on you! You have such a good eye for colours that suit you. Well, it is an ORANGE top, definitely!! I think the orange Vogue top looks awesome!!! 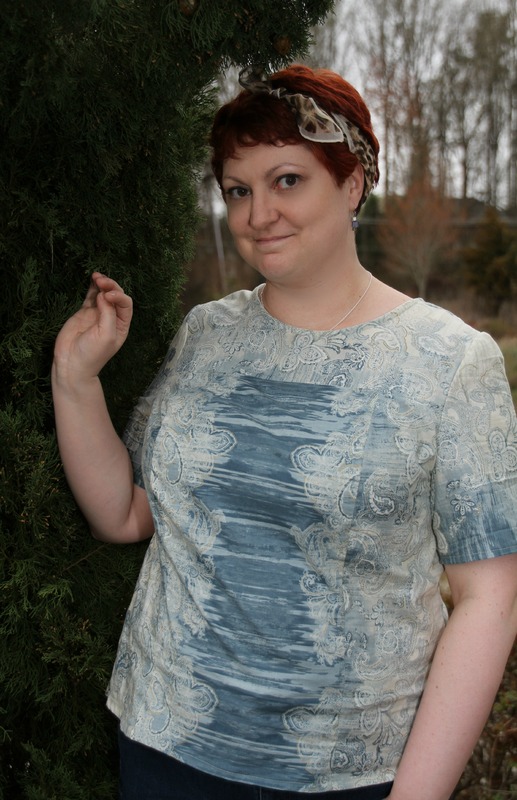 The blue top – it looks kinda bland – maybe because the neckline looks too high. Maybe it needs some ‘interest’ at the neckline, like a necklace or a collar or a scarf? But the orange one looks great! In my world, making something kind of bland is a challenge- this fabric was a little flat for me, I was trying to embrace new things!